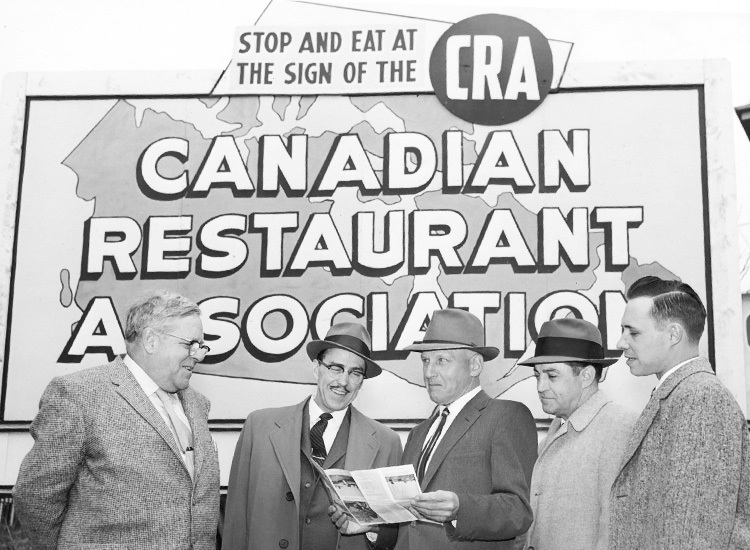 Times have changed since Restaurants Canada was founded as the Canadian Restaurant Association in 1944, but our purpose remains the same: to help foodservice businesses grow and prosper! Explore our rich history. led to the creation of a national voice for restaurants. With the Second World War underway, food rationing was killing sales, and the government was proposing menu price controls. Butter, sugar and beverages were scarce and some restaurants were forced into “Meatless Tuesdays”. Nine of the country’s foodservice leaders decided to create a unified voice — a national association to speak on behalf of restaurants and their challenges. And so, the Canadian Restaurant Association was born. ushered in the age of advertising. The cost of doing business was soaring and restaurants were struggling. Food prices in 1951 were five times the cost they were before wartime. But menu prices had only doubled since that same period. The Canadian Restaurant Association helped its small business members discover the power of advertising to attract customers and took out its own ads in newspapers across the country to promote the restaurant industry. started the rise of takeout. With more women entering the workforce, and the invention of VHS and home theatres, takeout food sales began to soar. Now known as the Canadian Restaurant and Foodservices Association, Canada’s national restaurant association promoted its members during a national Restaurant Week, reminding Canadians of the “pleasures of dining out.” The association also ran cooking seminars and other programs to teach restaurant and hotel members how to provide exceptional service. brought on massive expansion in member benefits. The Canadian Restaurant and Foodservices Association took note of a new group buying program called Groupex (which it eventually acquired) that gives independent restaurants the buying power of chains. Meanwhile, the association’s trade show — then known as HostEx — was selling out too quickly, leaving interested exhibitors without floor space, so it purchased the Canadian Food & Beverage Show to feed the need. Together these shows are now the RC Show! nearly cost the industry $200 million due to poor policy. Thanks to a successful cross-country media and letter-writing campaign, the federal government agreed not to eliminate the yearly basic exemption for Canada Pension Plan premiums. This had a remarkable impact on the industry, saving Canada’s restaurants nearly $200 million over the course of seven years. During this decade, the Canadian Restaurant and Foodservices Association also expanded its regional presence, opening offices in Atlantic Canada and Western Canada. were years of job growth and provincial sales tax wars. By this decade, Canada’s restaurants were employing more than one million Canadians! 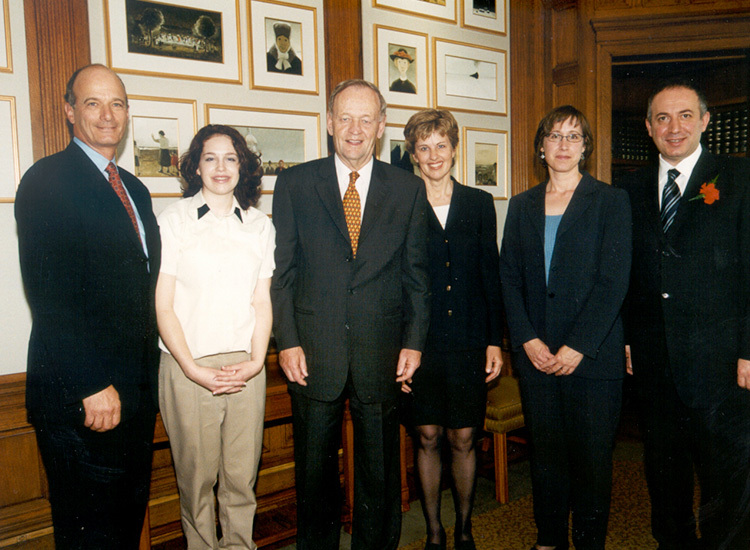 Prime Minister Jean Chretien met with the Canadian Restaurant and Foodservices Association to celebrate this milestone. At the provincial level, the association successfully fought off a sales tax on restaurant meals in Saskatchewan and eventually got British Columbia to reinstate its restaurant meal tax exemption. Regional offices were opened in Quebec and Central Canada. The restaurant business is always evolving and so are we. Under the new banner of Restaurants Canada, we are communicating a stronger, unified identity on behalf of our members. Representing the voice of foodservice, we will continue to ensure our growing community of 30,000+ businesses is heard. We look forward to spending another 75 years and more helping our members survive and thrive as the future of foodservice unfolds. Now that you’ve read about our past, join us and help us shape the future.